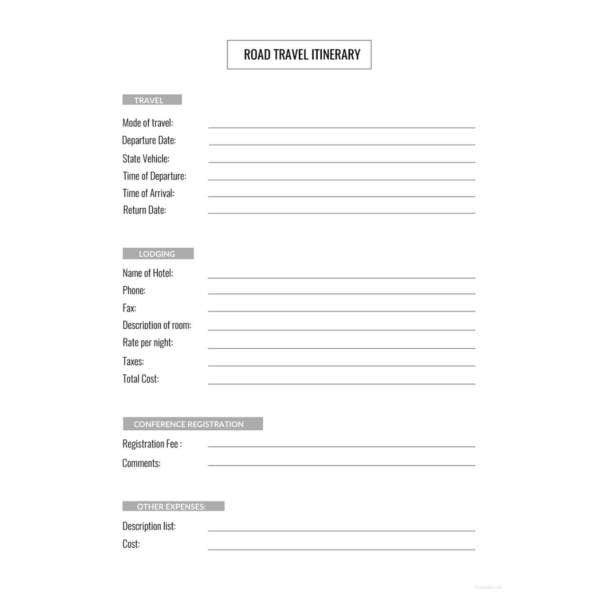 An itinerary template is a great help when you are preparing for some program or trip. Such a document enables you to maintain a written record of all the major facets of your program like estimated travel expense or meeting statement of your corporate meet. Do you have to create an itinerary now and are looking for help? Well, check out the readymade itinerary templates online which come with pre-designed itineraries waiting to be customized with details of your program. 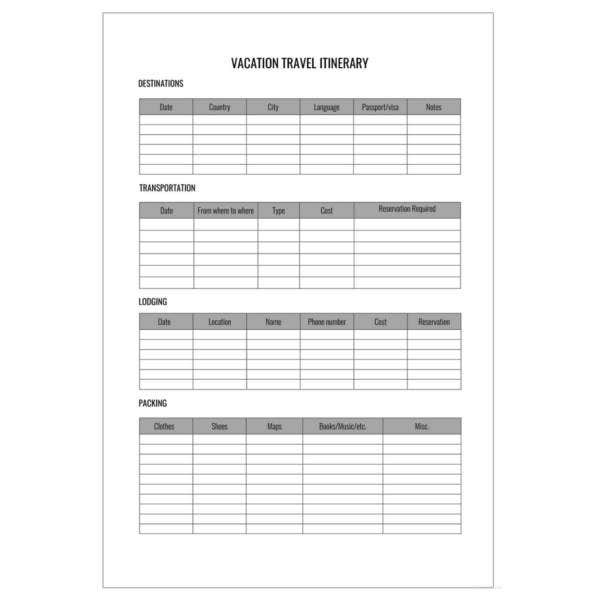 You have a smart corporate daily itinerary template here where you can record how many employees were present and absent and on leave for the day. You also have space to state the reason of absence. 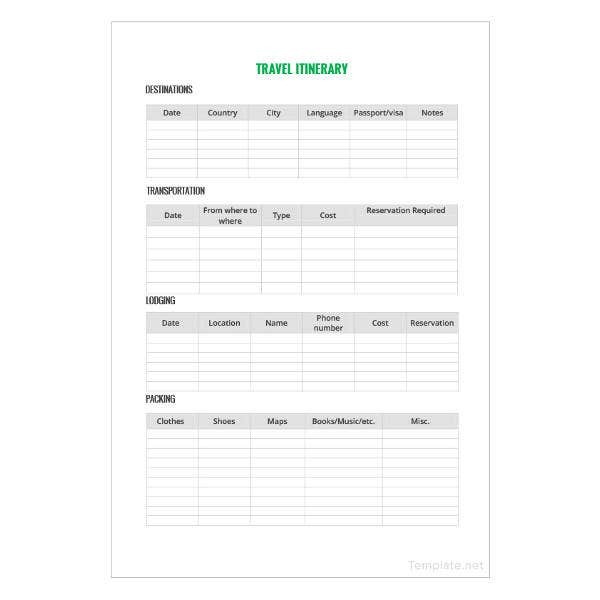 If you are entrusted with the responsibility to keep a record of meeting itinerary of the upcoming office meet, this template here would be handy for you. It allows you to note all important details of the meet like objectives, host, facilitator, note-taker, etc. 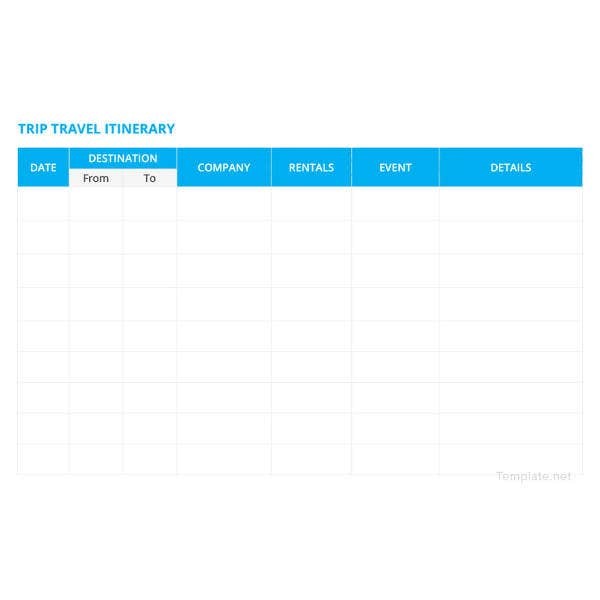 This trip itinerary template is a brilliant sample as it enables you to maintain records of each aspect of your trip like departing flight, car rental, hotel, as well as the meeting or event you are going to attend. 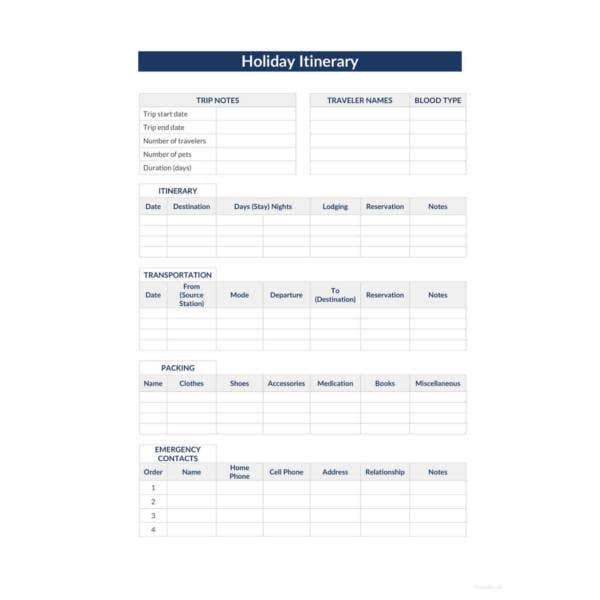 You have a detailed vacation itinerary template here that enables you to keep an account of all the major aspects of your holiday- like departure & arrival flights, car rental, pickup/drop, hotel, and activities. 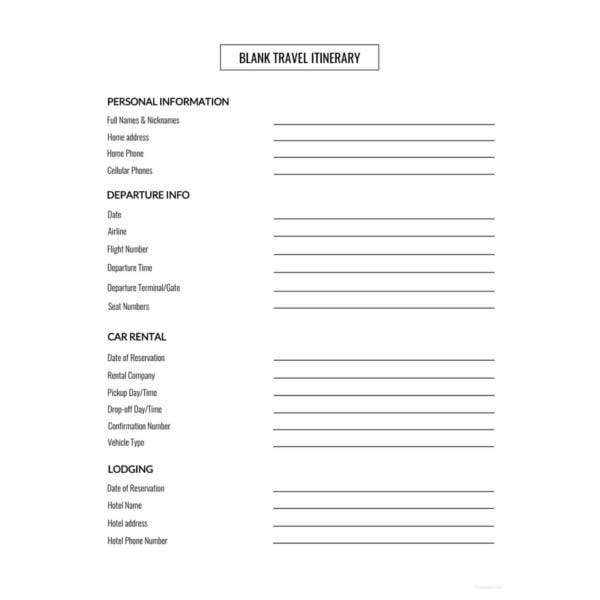 This travel itinerary template will enable you to maintain a complete record of your tour including departure date, return date, estimated expense, destinations, hotel, expenses, etc. You also have a section for comments. This wedding weekend itinerary will allow you to mention all the vital events of your wedding celebration from two days before the wedding, starting from rehearsal – with details of time and venue. > How to use the Itinerary Templates? The itinerary templates are a must have when you are going for a trip or having an event like a wedding or a seminar. These documents are used to list down the things to be done at the event and all the major aspects of it. For example, if it’s a meeting itinerary, you would have to mention details like the name of the meeting host and meeting objectives. If it’s for a trip, you would have to jot down the dates of arrival & departure, estimated expense and so on. 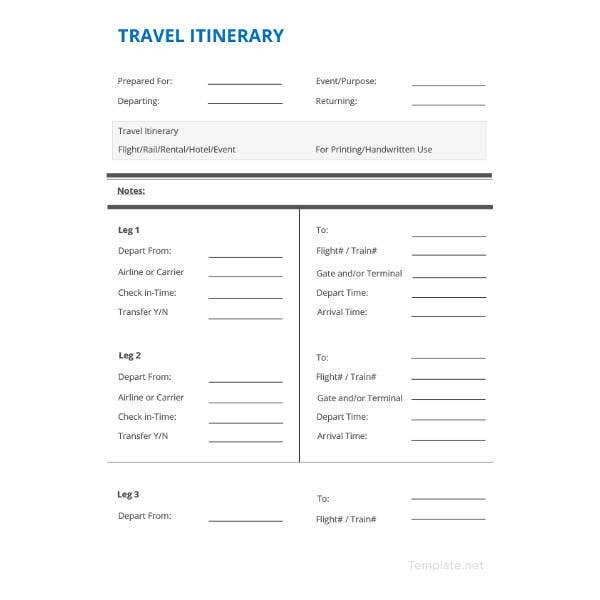 With the pre-designed itinerary templates, you would simply have to download and customize them with your specific details before getting a printout. 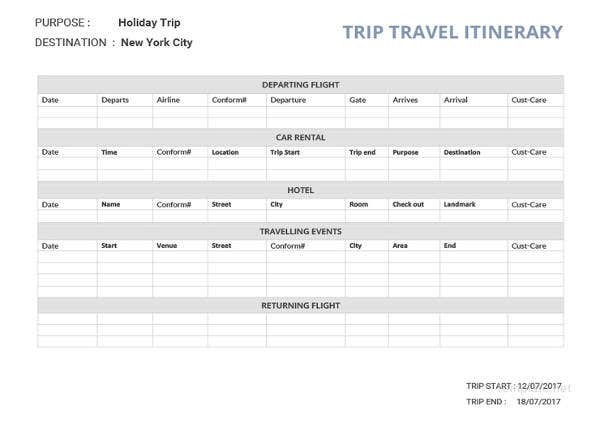 > What are the Benefits of the Itinerary Templates? 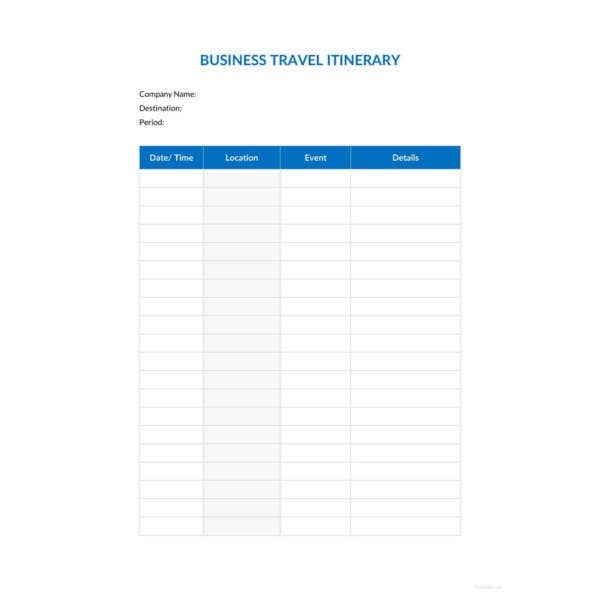 The main benefit of the itinerary templates is that they allow you to keep a tab on the major details of your event- whether it’s a wedding rehearsal dinner or a long-awaited vacation or a big shot corporate meeting. Another benefit of having an itinerary is that it saves you from forgetting the important details as now you have everything chalked out in writing. Thus, in case, you are somehow unable to recall the details of activities or such similar stuff about the upcoming program, one glance at the itinerary will easily get you a fair idea of the event.